Book hotel rooms online with us at Balaia Golf Village Hotel at the lowest rate, guaranteed. 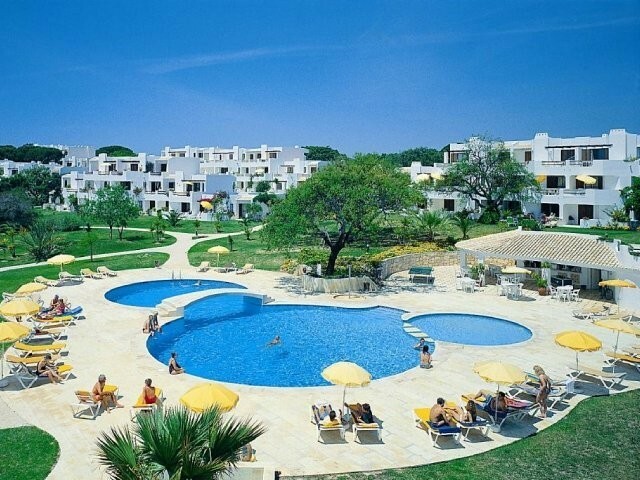 Get a holiday discount rate at the 3 Star Balaia Golf Village on the east side of the town of Albufeira in the Algarve. Designed with family holidays in mind it combines leisure and sporting facilities with over 500 well furnished holiday apartments and villas set in 40 hectare parkland. It is also within walking distance of a fine sandy beach. The Balaia Golf Village in the Algarve has 6 swimming pools with separate pools for children and one outdoor pool is heated during colder months. Its pride and joy is its well-maintained 9-hole Executive Golf Course with a Driving Range and Golf Academy. Also included in its facilities are 4 all-weather tennis courts with a resident coach, a Petanque Pitch, a Croquet Lawn, a Kids Club and play area, a Fitness Centre, sauna, steam bath, Jacuzzi and massage, a Supermarket, Medical Clinic, Hairdresser, Beauty Parlour, Paper and a Souvenir Shop.